It’s just a simple cipher that works by changing each letter in a word to the one that is 13 letters after (wrapping around after Z). 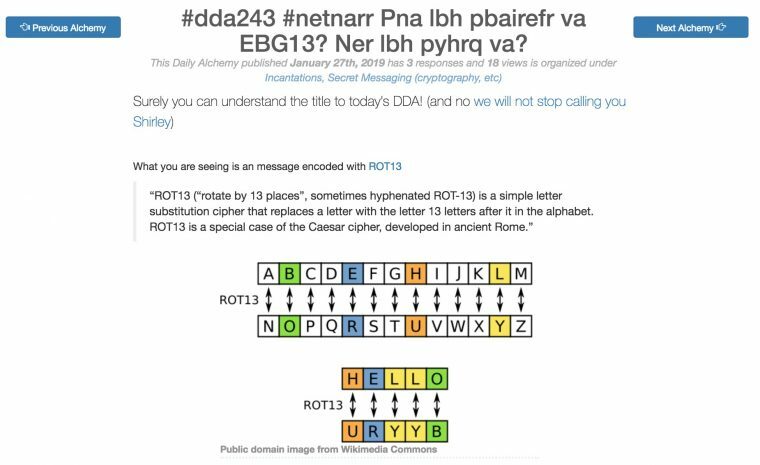 It’s nifty, because being half of the number of letters in the English alphabet, decoding can use the same formula (just add another 13 to get back to where you started). 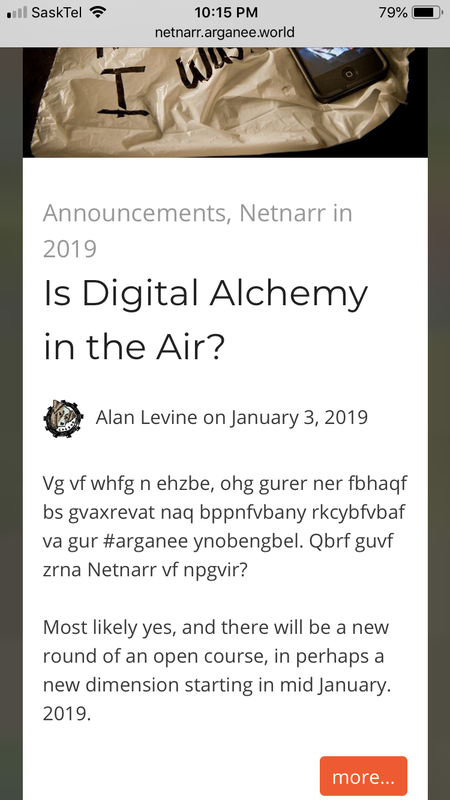 This was an early thing that happened when Mia Zamora and started planning NetNarr in 2016. We were excited that as a twitter hashtag, no one was using #netnarr. 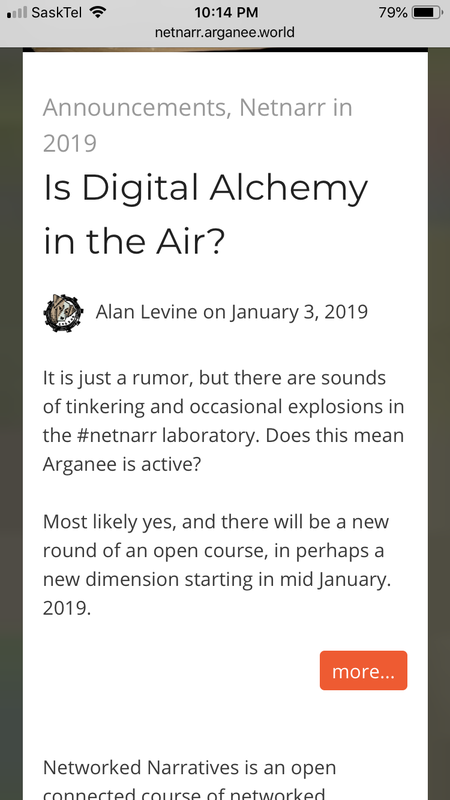 But then I shared rot13 where we found that #netnarr became #arganee… that sounded like a mystery world (hence the domain arganee.world (I wonder if anyone ever ventures there, it’s weird). I always did the encoding/decoding with a lot of roundtrip copy paste at the rot13.com site. As I saw two of our students going back and forth, I wondered if there was a Simpler Way. How can you do this? Well browser bookmarklet tools no longer work in Firefox, so do this in Chrome or Safari. Just click and hold this link, then draaaaaag it to your bookmarks bar in your browser. Go to your browser’s Bookmarks Manager, create a new bookmark in the place that puts them on your bookmarks bar, add a new bookmark, and past that chunk in for a URL (you might have to poke around for instructions, here is one set that might help). It sort of works on a mobile device, I used this set of instructions to add it to my iPhone Safari app. And look! I rot13-d it. It was not good at tweets, since in the twitter app, you cannot select partial text in a tweet. Nalubj, V whfg jnagrq gb funer fbzr qvtvgny nypurzvpny gevpxf gung zvtug vzcerff lbhe sevraqf naq jbeel lbhe sbrf. Featured Image: Magic Spell combined with Eight Trigram – Section 6.1 Round shape – John Ferguson 01.jpg Wikimedia Commons image by John Ferguson shared under a Creative Commons CC BY-SA license (which means I do too). Inverted colors of image and bumped contrast for better design with blog header.